Local Ford dealerships in the Denver Metro area of Colorado have once again teamed up with the YMCA of Metro Denver for their annual Halloween costume drive, Costumes for Kids. 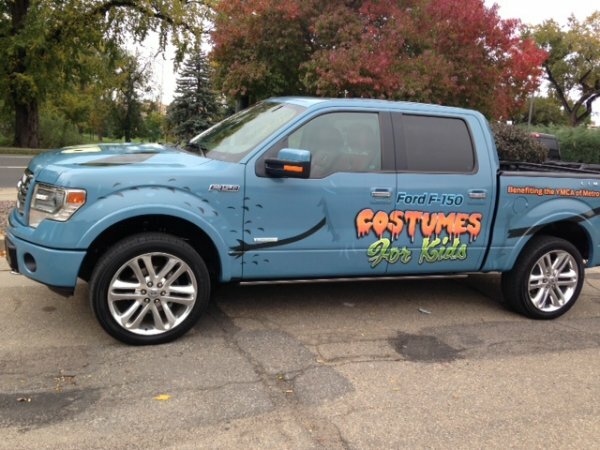 This year, a specially-wrapped Ford F150, the Monster Truck, is leading the tour so that people who attend free events to view the pickup can pose for pictures and be served snacks, treated to music, and participate in fun activities while being encouraged to drop off new costumes or Halloween accessories, which will then be distributed by the YMCA to children in need throughout Northern Colorado. The F-150 Monster Truck wears a Halloween-themed scheme around its baby blue exterior. The hood has eyes, the grille sports teeth, arms come forward from the doors, and legs run down the sides behind the rear wheels. The truck is a quad cab to carry its volunteers on their tour and the bed has plenty of space for the donations received along the way. To see the Monster Truck, beginning this weekend, if you're in the Denver area, you can view it at several spots over the next week. * Monday the 21st from 3-7pm at Groove Ford in Centennial. “We are very grateful for the partnership with Ford on this costume drive. We look forward to being able to help a number of children participate in Halloween this year with a new costume. This partnership is just one more way we are able to strengthen our community.” Jim Hiner, President and CEO, YMCA of Metropolitan Denver. Costumes and accessories can also be dropped off at the YMCA of Metro Denver located at 2625 S. Colorado Blvd. Denver, CO 80222. Anyone who donates will receive a 20% off coupon to Denver area Halloween City stores. Distribution of costumes will take place October 23rd and 24th, Location TBD.